Have you ever opened a brand new box of nitrile gloves and tried to pull out a pair only to have a clump of stuck together gloves come out of the box? The reason many new nitrile gloves stick together this way has to do with the post production and packaging process. Single use nitrile glove manufacturing involves dipping molds or formers into a nitrile solution. A release agent is used to make removing the gloves from the formers easier. Once the gloves are removed from the formers, many manufacturers simply leave the release agent in place and move the gloves directly to packaging. This is where the seemingly simple manufacturing solution starts to present problems. First, as the release agent dries it gets sticky so when gloves are placed together in packaging, the gloves can stick together so much that it can nearly impossible to remove just one at a time. A box of 100 suddenly becomes a box of 80 or 70 or 60 because of everything from contamination from clumps of gloves hitting the floor to having a significant number of gloves being unusable because of they’ve been torn as they’ve been pulled apart from each other. Second, once you’ve managed to get an individual pair of gloves out of the box, you might find that the release agent now makes it more difficult to don the gloves because of the stickiness as it begins to react to the moisture from your hands. 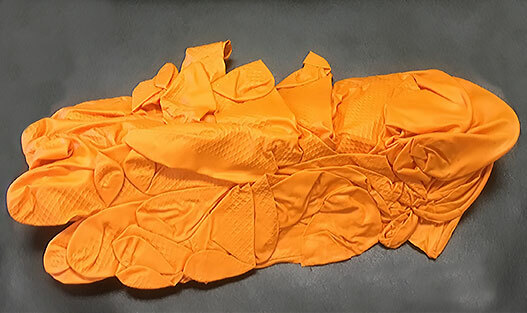 Third, any contact with fluids, including sweat, can rehydrate the release agents, causing the gloves to become slippery and running the risk of contaminating whatever it comes in contact with. The fourth area of concern when dealing with release agents on nitrile gloves is the potential effect on wearers’ skin. Although nitrile is hypoallergenic, the release agent is not, and people are often surprised to learn that the costly and painful dermatitis and allergy-like issues they’re facing are actually caused by a foreign substance, the release agent on the gloves. Fortunately, not all gloves are boxed and sold with release agents present. Although it’s easier and cheaper to leave release agents on product, SW is committed to an extensive post-production process called TouchTek® that removes these release agents before the gloves are 100% hand inspected and packaged. To the customer, TouchTek translates into gloves that don’t stick together, don’t get slippery, are easier to don and doff, are far less likely to contaminate work surfaces and that eliminate skin problems typically caused by release agents. For SW Safety, TouchTek is just one part of the commitment to provide only the very best value to our customers from start to finish. This entry was posted in 2017 Newsletter and tagged Nitrile, Nitrile Gloves, sticky gloves on October 27, 2017 by swsafety.